Hopes Are Fading For Missing In Italian Cruise Ship Disaster : The Two-Way Divers and rescue personnel are still trying to reach areas of the cruise ship Costa Concordia that haven't yet been explored in a bid to see if any of the 29 people who remain unaccounted for after Friday's crash off the Italian coast are alive. 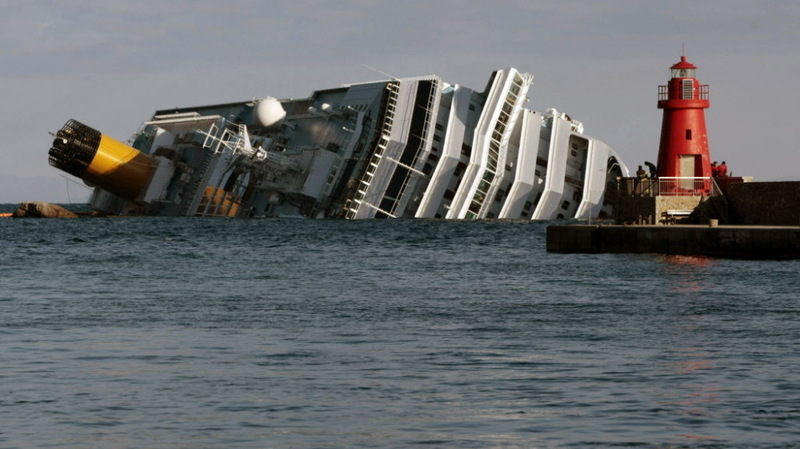 The cruise ship Costa Concordia leans on its side off the tiny Tuscan island of Giglio, Italy. Divers and other rescue personnel are still trying to reach areas of the cruise ship Costa Concordia that haven't yet been explored in a bid to see if any of the 29 people who remain unaccounted for after Friday's crash off the Italian coast of Tuscany might be alive. But as the BBC reports, hopes are fading. As of this hour, six people are known to have died. More than 4,200 passengers and crew were on board when it struck rocks, took on water and listed on to its starboard side. Searchers have blasted holes throughout the ship to gain access to some areas. At least two of the missing persons are Americans. According to The Associated Press, "family members issued a statement Monday confirming that Barbara and Jerry Heil of White Bear Lake, Minn., a suburb of St. Paul, are among the missing. The statement says the family is working closely with the U.S. Embassy in Italy and that they are confident 'everything is being done to find our parents.' "
Meanwhile, as the BBC adds, "Capt. Francesco Schettino has been detained on suspicion of manslaughter. ... Schettino, 52, has also been accused of abandoning his vessel before all the passengers had been evacuated." And, work is underway to remove fuel from the ship's tanks and prevent an spill into what is, the AP says, "a stretch of the Mediterranean said to be the biggest designated marine park in Europe. The rocky reefs are a scuba divers paradise, a natural habitat of dolphins and a protected area for many fish species." As The New York Times reports, the disaster has once again raised the issue of oversight of the cruise ship industry. "Five more bodies were found Tuesday from a crippled cruise ship, and a shocking audio emerged in which the ship's captain was heard making excuses as an Italian coast guard officer repeatedly ordered him to return and oversee his ship's chaotic evacuation," The Associated Press reports.